Festival of Sharing is held yearly in late September/early October at a central location in the Columbus area. Sponsored by Church World Service, the day provides churches of all denominations an opportunity to drop of CWS Self-Help kits. Kits may be of several types: hygiene kits with basic supplies such as washcloths, towels, soap, toothbrushes and grooming aids; school kits with a bag containing notebooks, pencils, crayons, scissors, erasers, and a ruler; or disaster clean-up buckets which have basic cleaning and disenfecting supplies, trash bags, clothesline, and laundry soap; or baby layettes with essentials such as diapers, pins, receiving blankets, and undershirts. Each year New Hope provides kits and also acts as a receiving point for other Shelby County churches to drop off their contributions for shipping. In 2013, fifty hygiene kits were assembled; in 2014, thirty school kits were provided. 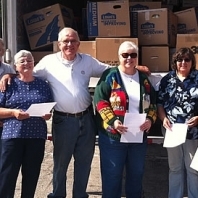 For 2015, fifteen flood cleanup buckets were assembled’ in 2016, thirty hygiene kits and twn school kits were assembled and New Hope provided the trucking for a 36′ U-Haul van of kits collected around the Miami Valley District.